Who is Maria Altmann? And what does sugar and art have to do with one and other? Maria Altmann was the niece of Adele Bloch-Bauer. And who was Adele Bloch-Bauer and why is this of interest right now? The movie Woman in Gold is about to be released in theaters on April 3 with Helene Mirren as Maria Altman in a story that has captivated the world. I was employed by Mrs Antoinette Bentley who married Leopold Bloch-Bauer. The Bentley Bloch-Bauers had escaped Vienna in a daring round of subterfuges and landed in Montreal by way of London England after the Nazi's entered Austria. Together Poldi and Toni (as they were affectionatley known by family and friends) had impressive skills; Mrs. Bentley was a champion dressage rider who'd competed against Austrian officers and beat them though women couldn't compete in the Olympics, she could have won. This gave her respect with the Viennese officers and this one thing helped to get them out of Austria. In England Poldi found passage to Canada by virtue of his golf game - he'd been greatly admired by someone in high places for his excellent sportsmanship in golf and that enabled the family after much delay to leave for Canada. It was in Montreal that Poldi chose the name Bentley out of the phone book to change their names to. They boarded the train and traveled across Canada to finally arrive in Vancouver BC. One of the reason they were able to prosper in Vancouver was due to Mrs Bentley Bloch-Bauer's father Otto Pick spinning cotton in his native Austria and because he bought cotton from the southern states he kept large reserves of cash in the US to buy the cotton and this is where the money came from to start what is now Canfor. Toni's only brother John and her parents also arrived in Vancouver and changed their names from Pick to Prentice. Poldi and John went into partnership and bought the sawmill on the Fraser River called Eburn Sawmill. Leopold's father was Dr Gustav Bloch and his mother was Therese Bauer who'd married in March 1898. His wife's sister Adele Bauer was 16 when her older sister married and the youngest of seven children born to banker Moritz Bauer president of the 7th largest bank at the time, general director of the Viennese Bankers Association and General director of the Orientbahn or Orient Railway Company. Gustav Bloch had an older brother Ferdinand Bloch who took over the family sugar factory in Czechoslovakia. Adele marries Ferdinand and in 1917 both families change their names to Bloch-Bauer. My employment with Mrs Bentley came after cooking school and an apprenticeship at Le Crocodile Restaurant with Michel Jacob. I had ended my last season cooking for tree-planters. I was the last live-in cook from January 1989 to May 1992. This next series of posts explores the origins of some of the recipes from my employer and starts with a short excerpt from a story I've been playing with. The recipe drawer was right under the toaster oven where each morning cook would lightly toast four thin slices of panettone fresh from Notte's Bon Ton Bakery. The breakfast tray was set up the day before by the upstairs maid and placed ready for the morning alongside the toaster oven. On a large silver breakfast tray lined with a starched white damask linen placemat was placed a brilliant crystal pot of red current jelly on a silver tray with jelly spoon. Next to it sat a gleaming silver tea pot filled with loose black tea leaves also set on a silver under-plate. On the far right at the top, a delicate white porcelain tea cup and saucer rimmed in gold. The breakfast plate was centered below with a white linen napkin folded into a gold monogrammed napkin ring laid to the right of the breakfast plate, a delicate fine bone china. Each morning cook woke early to turn off the security alarms and open all of the downstairs drapes. Then the next order of the day was to walk and feed Beau the household pet affectionately called Dog-a-lee by his owner. Cook would stew up barley and ground sirloin for his dog dish and kept a ready supply. At 6:45 am the breakfast tray was prepared. At the top of the plate were fanned five thin slices of pickled tongue. Cook made the tongue using a freshly brined beef tongue bought from the butcher on Granville Island. After a long easy simmer in stock she would slip the skin from the tongue and set it back in the cooking liquid to finish cooling. Once it was cold it was taken out of the broth and the pickled tongue put in the fridge ready for the next day. Cook had it timed where the hot water for the tea pot was boiling before turning on the toaster oven to toast the panettone. At this time the hot water was poured onto the tea leaves to steep and when the bell on the toaster rang the last thing to be placed on the tray was the panettone. Arranged exactly as the day before and the day before that and was the same meal every morning as long as cook had worked for her employer. This breakfast tray was delivered to Mrs Bentley an elderly widow who breakfasted in bed at exactly 7:00 am. 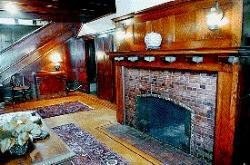 The recipe drawer resided in a Tudor-style Shaughnessy mansion built in 1911 in the Arts and Craft style with 10,000 square feet of living space. 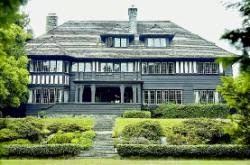 Designed by Samuel MacLure who was BC's top architect at the time for Walter Nicol. Nicol owned the Province newspaper and was BC's Lieutenant-Governor from 1920-1926. The home was left unchanged with the original kitchen cabinets and painted sawdust floor that cook battled to keep spotless as every drop spilled stood out on this surface. Beau had a leaky bladder and left a spotted path where-ever he went in the kitchen. During the week in the day-time the chauffeur Leo walked Beau. One Christmas he got into the kitchen when no one was there and demolished a large tray of hot out of the oven quail. Oh no! Cook was lucky as the the butcher at Granville Island was still open and sent Leo down to rescue the day and buy some chicken to cook instead. The recipe drawer was plain with a simple pull nob and about a foot wide and six inched deep. In this drawer were the recipes Mrs Bentley had introduced cook to so she could make them exactly as cook did who was instructed by the previous cook to make them as they had been made in Mrs Bentley's native Austria. There was a thin copy of Austrian cooking in English and older hand written recipes all in english. I'll stop my story here and hope you come back for another chapter. 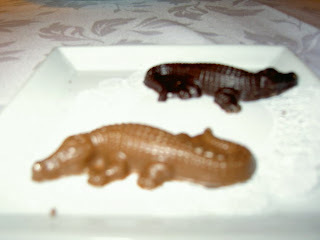 Lunch at Le Crocodile with the friendly foodies of VanFoodBloggers was everything that is fine dining. From the moment we arrived we were enveloped by the comfort of the surroundings. Every detail from the immaculately starched snowy white linens, the gleaming silver, the carefully selected fresh flower arrangements to the luxurious banquet seating - all of these elements expressing perfectly the hallmarks of fine dining that is so enjoyable. In fact it was so comfortable it turned into a decadent three hour lunch for most of us. Chef Jacob surprised us with an amuse bouche (a chefs way of saying hello) - a sumptuous melt-in-your-mouth tart of egg custard so fine and delicate it quivered. For the first course (after making much ado about the onion tart and the tomato gin soup in my last post) it was arranged that we'd all have a tasting plate of these two favorites. After that everyone would be on their own to choose whatever else they wanted. I was terribly keen to have the Kussi oysters and made this my main course. My fellow foodies however declined this treat - and with the mignonette sauce I was glad to have them all to myself. Kussi means precious in Japanese. They're not widely available outside of the west coast - lucky us! Foodie Wendy ordered a lovely meal that included pan seared Foie gras and proffered a morsel to taste which I gladly accepted. Where else but France do they have a law stating that "Fois gras belongs to the protected cultural and gastronomic heritage? Though there are several cruelty free producers now making ethical sources of Foie gras it will be awhile before chefs make the transition. During my time working as an apprentice preparing the mise-en-place for the chocolate mousse was yet another nerve racking exercise - do not burn the flaked almonds or over whip the cream - just do not do it! Sadly I lost the recipe long ago. This chocolate mousse has no comparison - trust this. With that in mind deciding what dessert to have between my two favorites - chocolate mousse and lemon tart - I went with both. Who can say when I'll get a chance to come back. Yes - good excuse! To decide the better dessert - well it just can't be done. Fine dining never lets you out the door without a small sweet token of appreciation and in Le Crocodile's case a signature set of white and dark chocolate crocodiles. Our group gave a rating of 5 out of 5 stars for this MeetUp and I was charmed to touch bases with Chef Jacob and to catch up on his family news. A cook collects recipes that come from many sources and when we have the luck to work in one of the cities greatest restaurants and to work beside a Master like chef Michel Jacob we join in a long line of cooks and chefs who have made the recipe their own, connecting us to the past and the present. These two recipes from Le Crocodile have been an important part of my repertoire both professionally and at home and have stood the test of time - after 26 years they are still on the menu. VanFoodBloggers is a Meetup group dedicated to sharing the cities vast restaurant scene. The group started meeting last fall with a hardy set of keen diners and bloggers who have been getting out and discovering some wonderful food. I had the pleasure of attending a couple Meetups and liked the group for their knowledge and passion. One fellow in particular - Simon - invited me to join him at my Alma Master - Le Crocodile Restaurant after I mentioned doing a stint in the kitchen. Simon - thanks for inspiring me to visit my culinary roots. Le Crocodile Restaurant is a classic Alsatian restaurant first, with a modern Vancouver flair. 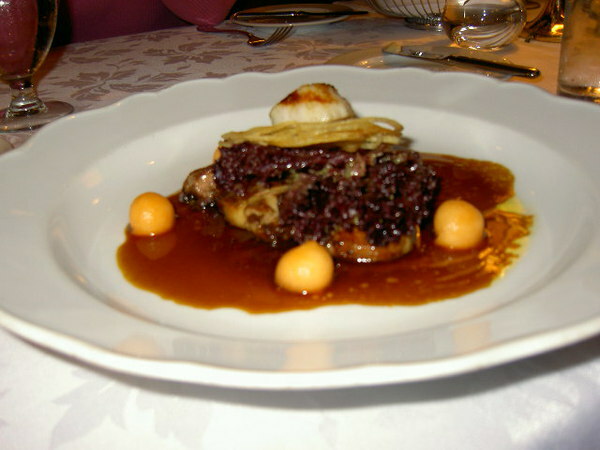 Chef Michel has been consistently excelling in his native dishes of Strasbourg in the Alsace region of France, but belonging to a city of modern tastes he has melded wonderfully the sumptuous foods of our city with his masterful touch making Le Crocodile into one of the greatest temples of fine dinning. One of my jobs at Le Crocodile was to prepare the onions for this tart and it was a tense part of my work - the onions had to be paper thin, evenly cut and then braised without coloring. Such a simple task you think - no it is not - many, many things could go wrong and if the slightest variant appeared there would be hell from the sous-chef, and the waiters even. This is serious business here - here I understood what consistent meant. Exacting standards don't come easy. This is the quintessential aspect of Chef Michel and his standards have earned him the respect of his peers and the highest accolades. VanFoodblogger are meeting up for lunch at Le Crocodile and it will be interesting for me to experience the present Le Crocodile while remembering what it was when I was there back in 1987. 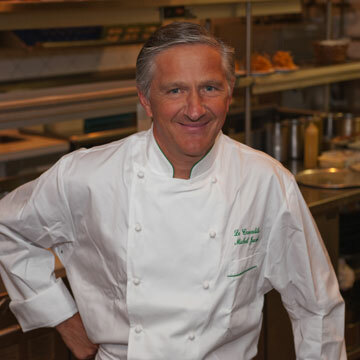 My memory of standing next to Chef Michel during the lunch service each day - where my responsibility was to make the plates ready for the food when the orders came in - he'd say "two meat plates and three fish plates" - I would put the garnish on the plates and into a 500 F oven for mere seconds, timing it so everything went out sizzling hot, but not curdled - is still a source of confidence for me. It was dangerous work. I had burn scars on my arms from my wrist up for years. I am looking forward to trying the Kusshi Oyster grown by Keith Reid of Stellar Bay Shellfish in the Comox Valley, thought by any who have tasted these as the 'ultimate oyster'. This article describes best the pleasures of the kusshi. To my fellow VanFoodBloggers who will be joining me - see you there. I know it will be delicious and we'll be sharing some of the best food in Vancouver and beyond. Merry Christmas to all. I make this post for my daughter who is far away in England. She has requested the family menu of the Clearwater Christmas of her childhood as she is making the Christmas meal for her new family. Growing up in the small interior town of Clearwater in central British Columbia it was a white Christmas with deep snow and a nearby ski hill which the community flocked to on Christmas day. On Christmas Eve we'd gather by the fireplace and drink hot chocolate before dressing up in snow pants and such to toboggan down a hill with as many family members as we could fit. It was laughing all the way, snow flying in your face and ending up in a tangled heap at the bottom of the run. Later when I was married and our daughter was young I added tourtiere, the classic dish of the Quebec Christmas Eve Reveillon, (her fathers' heritage) to the menu and large loaves of homemade French bread. There would be pickled beets and bread and butter pickles made from my mothers garden. It was a wonderful meal we all enjoyed. Our family still dine on the china of our childhood and we count our blessings to have both parents and all siblings - now married with their own children to celebrate the season with. We honor life and let bygones be bygone. Our Christmas meal of roast turkey and stuffing with mashed potatoes, candied sweet potatoes, broccoli with cheese sauce, cranberry sauce and the best turkey gravy you could have changes a little each year but of all the things we prize is having everyone gathered together under one roof. Together in 2009 with the hearts full of good cheer we brought the traditions to the little ones and shared in the delights of winter sport and evenings full of good food. This was a grand Christmas with all the family together for the first time in 17 years. A cold and snowy year it was with a full moon to light our way home after a day in the backcountry skiing on Raft peak. Today we are spread out and won't be together but in spirit and the blues will come reminding me of my humanity and that love is a place in the heart that keeps me close to all the ones I hold dear - both the living and the departed. Snowy Mountain Alpine Tours is now booking for the 2010/2011 season. Be the first to experience this rustic luxury and have a run named after you! The newest and largest backcountry skiing venue and the first guided backcountry ski operation on crown land in the Cariboo Mountains sits on the eastern edge of Well Gray Provincial Park and is over 100 square kilometers of tenure. This summer I was invited to cook for the crew for the first phase of developement. Blue River BC is a destination for some of the best heli skiing in the world. For over thirty years Mike Wiegele has made these mountains a mecca for powder hounds. My history with Blue River goes back to a youth of ski racing and again when I took up backcountry skiing in the late 80's. It has hosted the Powder 8 World Championships and it is because of the deep and dry powder. Love of powder skiing and cooking was the inspiration in naming my food blog ... Powderate. This type of cooking has some challenges and one of the important requirements that makes the task smoother is to have most of the main entrees prepared and frozen ahead. This helps keep the food during transport and in this case was done by helicopter. Here is a photo story of the event. Flying in the camp and equipment including one five year old and three dogs. This was mid July and the weather is about to get extremely hot and dry for the duration and fortunately the forest fire smoke hadn't hit yet. The wall tent was brought in and erected by snowmobile in January of this year. The heavy snow fall and the bears had taken a toll on it but an afternoon of needle work helped keep the pesky insects to a minimum. Crew accomadation for the duration of construction. The Alpha tent in the background, erected early in the summer became my domain and the cook house. In this photo is Steve Ludwig and Raven the black lab that I was fortunate to have keep me company at night. Thanks to this sweet little machine we had some extra luxuries to keep us happy. Like beer! The beer garden. Nothing like a cold beer from the creek on a hot summer day! 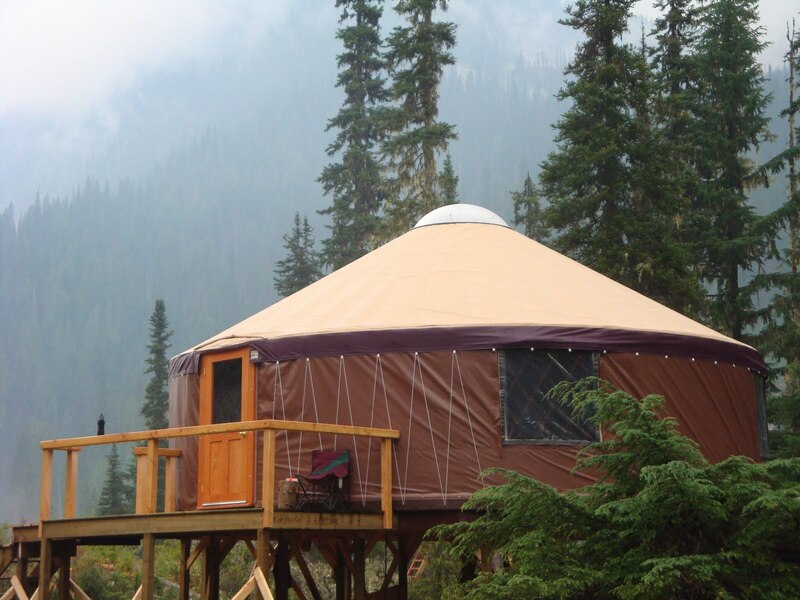 The hard work of master builder Dave Volmer soon has the yurt deck inshape. He took time to install a floor in the cook tent and build a little girls dream swing. Dave Volmer and Astrid taking a test ride on the swing. These are savory meat pies that I made ahead and froze. The fillings are fresh sockeye salmon and roast moose meat and curry sweet potato. Trail building was an ongoing task and the accomplishment of this was done by Dana Ludwig and Brenda who made sure the trail was complete for the hike out. Bushwacking was the only way get around and until the girls built the trail out we'd be following the cariboo trails. The trail out has some of the biggest patches of fern I've seen anywhere. Dana, Astrid and puppy Oscar on the hike out. Extensive trail building and bridges were required to access the base camp. June has always been about adventure and discovery. This month the adventures included finding a remote and rugged Hot Springs accessed via a steep canyon trail with exposure that is drop dead gorgeous. Our day started with a bowl of first of the season huckleberries after which we were fit and ready to descend the canyon wall where the secret Hot Spings is located. The weather was cool and wet and I was glad as the day before was sweltering and we put off going down the canyon in favor of a shaded camp under old growth cedar trees. We put on the Gortex hiking boots and rain gear and set across a flooding creek to get to the trailhead. The rewards of the day, not a soul about but us ... and the raging river rushing by was an obvious thrill. While away the garden has become a monster of growth and a wonderful neighbor has been watering it. With the garden producing outstanding greens ideas for supper become salad centric. The lettuce above is called Farmers Market Lettuce Blend from Renee's Garden seed company, comprised of Little Gem, Tango, Outredgeous and Cimarron. Such a treat after grocery store lettuce all winter. Tender and robust at the same time. The orange mint in pots is pretty and ready for cutting. I'll use some in a dressing along with wild ginger root picked on a recent hike. Wild ginger grows in shaded forests and their flowers are quite unusual. Just peek under the deep green leaves. Use the roots not the leaves. After picking keep roots soaking in shallow water until using or dry for later use. The moose roast below is a gift from the family hunter and will be braised in organic beer. Time to snip herbs from the garden, yet another thrill. Minced 2 green onions, large bunch of orange mint, 3 fresh thyme and oregano sprigs and add it to a small bowl with 1/3c Dijon mustard. Set aside. Season roast with salt and pepper and brown on all sides in a heavy bottom fry pan. I use a combination of grapeseed oil for it's high smoke point and clarified butter to brown the roast in. Peel and slice large white onion and place in bottom of large dutch oven. Remove the roast from fry pan and place on the bed of onion slices. Spread the wet mustard and herb paste over the roast. Pour one bottle of good organic beer and cover with lid. Braise in 325 F oven for 1 1/2 hours or until tender. Let set. Remove the butchers twine and slice thinly. Spoon broth over the sliced meat. my very first garden has vegetables coming up! places in the heart by Lee Ann Foster is licensed under a Creative Commons Attribution-Noncommercial-No Derivative Works 2.5 Canada License. Based on a work at powderate.blogspot.com.